Well the big day of the week finally arrived....Yeah!!! Today was a blast!! 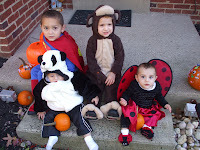 All the kids were so excited about trick-or-treating....they could hardly nap today...the excitement had taken over! After getting everyone all ready...dressed in their costume, drinks for the walk around the block (as they always get so Thirsty! ), shoes on, bottles in hand, we were off..... outside to take a few pictures...well side shots mostly...It is nearly impossible to get four little ones to all look in the same direction at the same time while saying CHEESE!!! I think we took about 20 pictures and we are lucky if we have 1 good one......Oh well..try again next year!! We started out real strong, walking from house to house, pumpkins in hand (to hold ALL of the candy, of course!) saying Trick OR Treat, saying Thank You...etc. We quickly lost a bit of steam in about 10-12 minutes. At about the 3rd house, the kiddies were getting tired, ready to go home and eat the 6 or so pieces of candy they had received and they were Happy with that. Well, they were happy with that...but my sister and I not so happy with their theory. ... WHY? Well where do I begin...We took many trips to the store to get the costumes, matching pants and shirts for underneath for the too little guys, got the strollers out, backed up with goodies, woke up the kids early from their naps, and they are already DONE with trick or treating..... BUT you know what.....It's Okay..... For those few houses they had the best time in the world...they were so excited to get all dressed, show off their costumes, and most of all get a few pieces of candy!! And to see the smiles, laughs, and excitement was well worth all the effort my sister and I put into it!!! We did get to go around 2 blocks and Trick OR Treat..they just needed a little break..and to have a piece of their hard earned candy!! !Which they thoroughly enjoyed!!!! 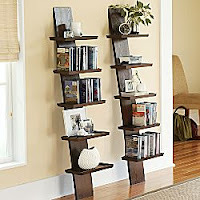 when you spend $50 or more in select categories get free standard shipping. Offer available online only. Discount applied at Checkout. Some deals I found.....they have much more too!!! Also check a round tomorrow at Target, Old Navy, Kmart, etc. Halloween items Should be clearances!!! One more sleep to go...YEAH!!!! I am SO excited to see him have the best day tomorrow!! He just makes me feel so warm and fuzzy inside when he is having such a great time. It is so amazing how becoming a parent changes you so much....it all about the little ones...I guess you cannot help it sometimes. We sat down today and practiced writing his name on paper...the ruled kind. We just started practicing about 3 weeks ago and he is making leaps and bounds. He tries his very best to stay within the lines,you can actually read his name on the paper!! (not just mommy can tell what it says) He has been really practicing so he can write his name in Pop Pop's birthday card...One more day and were there! Free Taco at Taco Bell today!!!! Free Crunchy Seasoned beef taco at Particiapting Taco Bell locations today Tuesday 10/30/07 from 2pm to 5pm. This is Thanks to a stolen base during the World Series! Was at ShopRite today and they have Beechnut baby cereal on sale this week for just $1.39 a box (including Good Morning and Good Evening too!!) for ONLY $1.39.....An even better deal when you use a manufacture coupon as well!! They were in last Sundays paper, or you can call Beechnut and they will send you some!! Well, where do I begin?? I am so disgusted with Luvs diapers! They are horrible! I recently recieved a few $1.00 off coupons for Luvs diapers in the mail, I was so excited....YEAH coupons for things I actually need!! So I heard Walmart lowered the price of Luvs down to $6.97, so me my coupons and the kids headed there.... Of course I bought 3 packs (had to use up all my coupons..LOL). I just opened the first pack up on Friday and guess what...5 leaky diapers later....I cannot wait for them to be GONE!!! All the leaks happened during the day..not even at night??!! On Friday two leaked, and yesterday one leaked and today 2 more leaked. It stinks...literally!!! My hubby was quite disgusted yesterday. 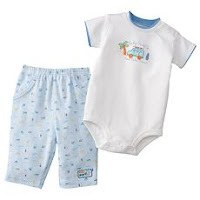 I have been using Pampers since my baby was born at the beginning of this year. Wa mart and ShopRite have been having them on sale ALOT...and with coupons and baby buck (at ShopRite) they have been a great deal!! 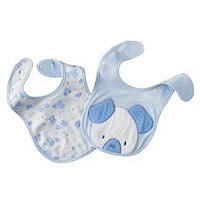 I was an avid user of Luvs back when my son was in diapers and they were great!!! No complaints at all!!! New Bear Hug Stretch premium elastic sides stretch to fit. Luvs® helps stop leaks as well as the pricey brands. For great leak protection, all you need is Luvs! Not only do Luvs Diapers provide premium leakage protection for less than the pricier brands, but we also offer the Ultra Leakguard Guarantee. That means if you aren’t satisfied with the way Luvs works, you can get your money back. * So, you can feel good knowing you have premium leakage protection, and for less than those pricier brands! I will for sure be sending in a diaper, and my reciept for my money back...They can keep 'em! Today was a great day....finally NO Rain!!! YEAH!!! A nice relaxing Sunday.... Plenty of time to hang out with the kiddies today...Hubby was out all day helping with my sisters kitchen re-do. Got to play cars with Logan today.....He gets OH! so excited when we play cars together. He's so darn cute...I am positive I am biased towards him....LOL I just cannot help it! I do not know what it is....maybe the 1st born thing??? Not to say that my daughter is not just as wonderful.....of course she is!! If it is even possible, maybe I love them each just as much, just a little differently??!! They are running a FREE shipping special if you spend $75 or more (expires today) ....Also if you use your Kohls chargesave 15% off with code MVCFIFTEEN (expires 11-7-07). If you are in need of baby food....Acme Markets has Beechnut baby food Satge 2 on sale until November 1st (Thursday) for .40 a jar. There were coupons in the Sunday paper this week for $1.00/8 jars and $1.00/10 jars. A long but Happy :) Day!!! We'll today has been a long day for me and it is only 2:00 in the afternoon. See my husband is redoing our kitchen this week so I spent the day at my mother in law's yesterday, and today I am at my sister's, and all I want to be is at home. And this is only day 2!! Man I sound so unhappy, usually I am always in a good mood, maybe i am due to get my friend or something. I guess I thought it would go alot better than this, really I don't know what I was thinking. But I do know I will never again redo a kitchen this is to much work, and I haven't really even been doing anything. I mean it is just hard with the kids Haley today just wanted to stay home, but with all the dust and sawing and hammering my husband thought it would be best just to spend the day at my sisters. So here I am typing on the computer. I actaully feel better now that I am venting, sorry to ramble on. So thats it I won't talk about it anymore. Today is a beatiful day a little chilly but I am glad to see the sun out after so many days of rain. I am going to find myself something to eat and will hopefully write again later on tonight when I go home. Can't wait for that!!! Talk to you later. 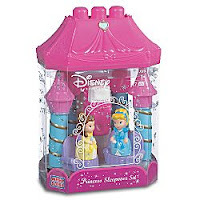 It also is eligible for FREE Super Saver Shipping on orders over $25. 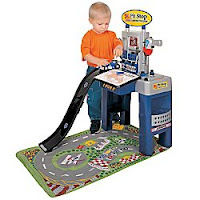 This is a great deal....save 75% off!!! 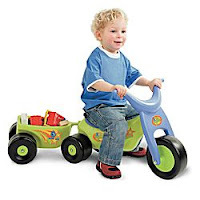 and a Toddler Bike and TrailerWas $34.99; Now $19.99. 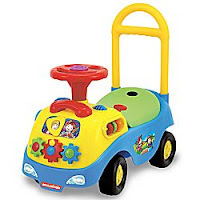 and for the baby on the list...My First Activity Ride-OnWas $24.99; Outlet Price $14.99. 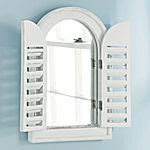 For the Home they have great deal like: Window MirrorWas $49.99; Outlet Price $16.99 and a very nice Addison Shelf Was $99.00; Outlet Price $29.99. In addition to the GREAT prices there are also coupons......$10 off a $50 purchase use coce 02001090001000000000582 OR for $15 off a $75 or more purchase use code 020015900010000000005843. Hurry coupon codes good for tommorrow Saturday ONLY! 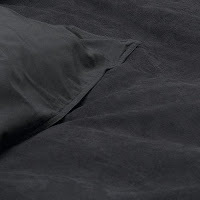 Another Great Deal of the Day: Black Microsuede Full/Queen 3-piece Duvet Set for only $19.99 at Amazon.com. PLUS Free Super Savings Shipping. Would make a great upcoming holiday gift!! We'll here it is, day 2. Today was a real dreary day with all the rain, I guess I was getting used to the great weather we have been having. I mean earlier in the week I was outside with the kids and they were playing in the water table, today we were wearing sweatshirts. We'll enough about the weather. I had a good day today though it went by fast although the week in general has been going by slow but that is just because my hubby wasn't home this weekend. Haley keeps asking when he's coming home, and always asks me in the morning if Daddy came home. I hate to tell her no because her face just fills with disappointment. Although he should be home on Saturday and he has off the whole week, Haley and Nick will be so happy. We'll I don't know what else to write since I am new at this thing, I don't want to bore people. I am though debating weather or not to make brownies. See I really want to eat brownies, but I know my waistline dosen't need it. Hopefully I can resist, but its not looking to promising. 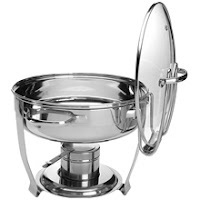 Great Deal of the Day: Check out this 4 Quart Stainless Steel Chafing Dish at Linens N Things, it is on Clearence for$19.99 (Regular Price is $49.99) ...These are great to use for the upcoming holiday parties/gatherings! Also use coupon code FFOCT07 and save 25% off your total purchase. Well how about 8 am this morning......A little earlier than I like to wake up, but hey....when my son is on the toilet screeming for me I must run and help him clean up to get off and back on the sofa to watch his beloved "Mighty Monster Trucks Show". Yes, you read right, about 4 out of the 5 weekdays this is how I rise in the AM...to my son on the hopper calling for me loud and clear....Of course he does not do this on the weekends when daddy is home.......Lucky me!!! Finally got out of the house by 10 am to head over to story and craft time at the library..Guess what, my son says after we get there "he just like to pick out books and have a home day today". Great, the one day we are actually there a little early and he wants to leave.....So we left. Off we are to our next stop, doing a little shopping. I needed some new baking pans badly...why? do you ask? Well my siter was a witness to this...I burnt the sugar cookies so badly last week that I could not even scrape them off the baking pans...So to the trash they went. Had a nice relaxing evening as my son did not nap today, so bedtime was at 7:40 pm....hence why I got a chance to set this whole thing up!! No nap was actually a good thing today Tash...I know you do not hear that from me often! !